Hi, I’m Elo Tarie. Trained at the ESAD ( Superior School of Arts and Design) of Orleans, I founded my creative studio Élotarie, specializing in graphic design and photography. My creations often combine different medium, such as drawing, photography and typography. It’s a bit my signature whether for graphic design (Art direction / Global branding creation / Edition / Motiondesign / Webdesign) or for photography (Wedding / Fashion / Book / Reportage / Shooting Products / Lifestyle). I chose to be independent because I like the direct contact with my clients, it simplifies the exchange and it allows me to be completely attentive to your projects. I am based in Paris and Orléans, but I’m working with you all over France and abroad. Can you tell us something about your desk setup? My office is in my bedroom. My boyfriend and I have cut the room in half with the clothes closet. My office is on the side of the window with my library and my inspiration wall. The bed is on the other side, it’s more cocoon. Sometimes, I work in my living room, in a cafe, or even among friends, but my favorite place is still my office. 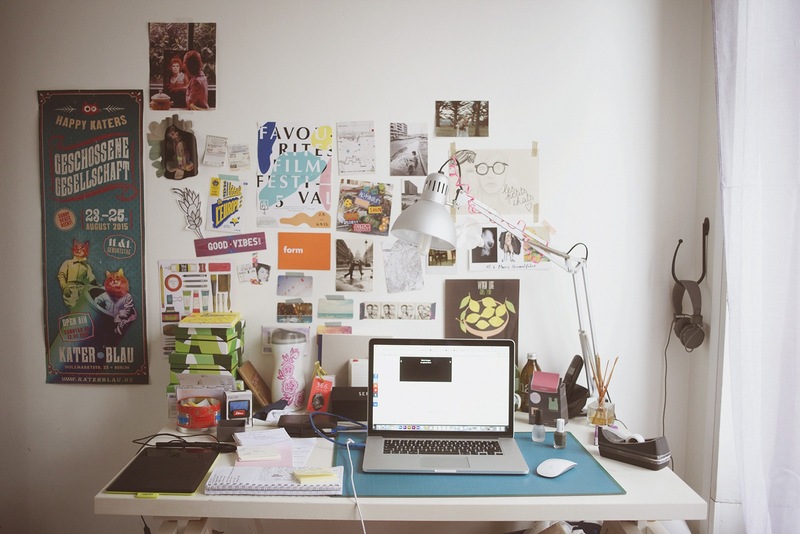 Desk Hunt reader submission by Chicks Who Code founder Maria-Lola Conrich. Desk Hunt reader submission by maker Karl Ranna.